Prof. Ashok B. Lall is an eminent architect and principal of Ashok B Lall Architects in Delhi. The firm has executed several well-known projects in India, including the headquarters of Development Alternatives in New Delhi. 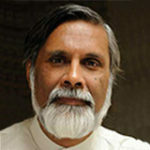 Prof. Lall is a strong advocate of low energy sustainable architecture. He also engages in architectural education and is a visiting professor at Guru Gobind Singh Indraprastha University, New Delhi. This is the first part of a 2-part series on using shading to keep your home cool naturally. When we talk about energy efficiency of a building, we are talking about both about heat gain as well as heat loss. While in hot climates, the priority would be to limit how much heat enters a building, in colder places, the requirement would be to allow more heat in to keep the building warmer. Given the climate conditions in India, thermal comfort is mostly about limiting heat gain and keeping a building as cool as possible. One way of keeping a building cooler naturally is by using external shades. In fact, shading is absolutely necessary in hot and warm climates. However, over time we seemed to have forgotten how easily and effectively shading can be incorporated into building design. While traditional building designs often took shading into consideration, this seems to have got lost to the current culture of architectural design. No longer are the majority of architects designing buildings in response to the local climate and how the sun moves around the structure. To make things worse, there is also a misconception, which is further pushed by the glass industry, that dark glass or double-glazed glass on windows will do the trick of keeping heat out of your homes. The fact is that these are not the most effective, nor are they the most pocket-friendly solutions that you can turn to. Because there usually isn’t much demand from clients themselves, architects might not get into the specifics of natural solutions to keeping your house cooler. Most architects and homeowners have resigned to the fact that air conditioners cannot be done without. While using shading in your house does not mean that you will no longer need to use air conditioners, it can significantly reduce the need for using it. As mentioned earlier, using shading to keep homes cool were traditionally practiced as part of building design. However, there is a need to revive these concepts and practices again today. While in more developed countries a number of different kinds of shades work as options, in India currently our options are limited. The second part of this blog will go into the kinds of shadings we can consider for Indian conditions. Stay tuned for our second part which is coming out very soon.